This is part two of our previous post on quality cues. Quality cues are indications of quality in packaging, displays, product features, collateral materials, website design, messaging, etc.The more quality cues you can offer in your luxury real estate practice the more your personal or company brand will become distinctive. When marketing luxury real estate, use as many quality cues as possible to connect with your clients emotionally. Messaging is extremely important. We cringe whenever we read how a home “boasts” some feature like an infinity pool or a state of the art entertainment room. Instead, reach for the emotional connection with potential buyers. For example: Communicate the sense of relaxation and relief they will feel when they plunge into the pool after an exhausting day, or the enjoyment of watching movies and eating popcorn with their friends and family. And, take a cue about quality cues in messaging from a mass marketed coffee brand that overcomes the perception of being too big to care about customers—Tully’s coffee. In part one; we mentioned that we purchased a 12 oz. bag of Gelson’s Finest coffee at Gelson’s market. A gold clasp that helped reseal their package was an important quality cue. That same day we also purchased a 12 oz bag of Tully’s coffee. 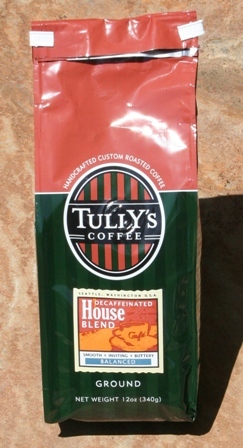 Tully’s is available at over 5000 markets. We like their Decaf House Blend. Tully’s quality cues are right on their package and on their website. It’s more in their messaging than in their graphics. For example, on the package you can read that “coffee is our passion”. Here is their call to action: “Enjoy a cup and celebrate the wonderful complexities of our pride and joy”. On their website, you are asked to “Taste Our Obsession”. There are many Tully’s coffee stores. We spotted one in Seattle on our last visit there. To make a deep emotional connection with customers, Tully’s lets you know that “Community is their Commitment”. Tully’s is proud to support many local organizations that focus on children’s educational development and health. Here’s yet another quality cue in Tully’s messaging: Their description of the decaf blend is “smooth, inviting and buttery”. These are emotional quality cues followed by the word, in bold—BALANCED. These words resonate with the values of coffee aficionados and thus become quality cues.